I have been aware of this book’s existence and influence for a long time but never read it. 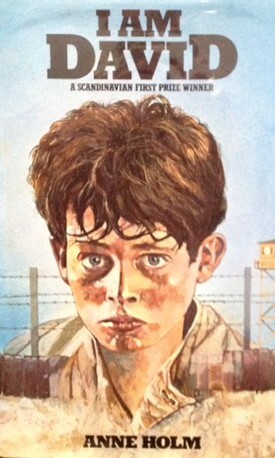 It is an intense haunting tale describing cruelty, loneliness and fear as part of the emerging identity of a young boy who has escaped from life in a concentration camp. It is certainly not a light read but so engaging and well written ( if the translation is anything to go by) by the Danish writer Anne Holm, that I’m not surprised that it won first prize in a Scandinavian competition in 1963 for fiction aimed at older children. It has an old fashioned atmosphere and style that might challenge some twenty first century readers but I was captivated from the outset as the panicky David first runs into the outside world. He has escaped with the help of a prison guard ( referred to as ‘the man’) who has always taken a relative interest in his welfare. As he desperately stumbles on through the mud, freezing rain and lacerating thorn bushes, we share his terror at being hunted down. He is always exhausted and often starving but manages to survive against all the odds. He can never relax as he travels across Italy, Switzerland and Germany as he has been conditioned to be suspicious of everyone. When questioned about his family and reasons for travelling alone, He invents a plausible story about searching for the circus where he belongs after recovering from a long illness. I found it to be an deeply moving book that vividly conveys the apprehension of a boy who is trying to make sense of what is often unfriendly and sometimes dangerous world. He is a very resourceful and resilient child who has soaked up several languages whilst living in the camp but subsequently speaks them in a rather quaint way that makes people comment. He gains some solace from reciting the psalm that he dimly remembers from the individual who first took care of him in the camp, whose death he had witnessed. His attempts at prayer when faced with difficult decisions jarred with me at first. I then realised that they add to the mystical flavour of the story and so provide an important stylistic function. It is also an important link to his Old Testament name and his growing self awareness. We gradually learn about his physical characteristics that he himself has never seen until he finds a piece of broken mirror to use. As the story progresses, we also learn that he has unusual eyes and a still, solemn face that does not know how to smile. He finds normal conversation difficult and explains that he does not know how to talk to other children and cannot understand the point of playing. The emptiness and horror of his childhood shines through moments such as this. Despite his very difficult long journey, it is ultimately a hopeful book as several incidents along the way give him confidence in the humanity and kindness of individuals.We learn some of his personal history as he draws nearer to Denmark – his longed for destination. David is an individual as the assertive title suggests, but he is also representative of all the thousands of refugees travelling across Europe after the war and perhaps symbolises all those seeking sanctuary throughout time. Particularly in the current climate of horrendous news stories about so many displaced suffering people, this extraordinary book deserves to be read by children and adults.